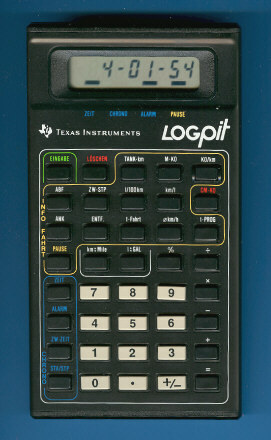 Size: 5.3" x 2.9" x 0.95"
In 1982 Texas Instruments changed the design of the original LOGpit slightly. Please compare the color of the name plate just below the LC-display. Please notice the LOGpit sold by French carmaker Renault to its customers. The model was available in both Englisch, French and Italian lettering named TI-2001 GTI. Compare this car-computer with an airplane-computer sold by Cessna and the TI-2000 Time Manager. © Joerg Woerner, January 8, 2007. No reprints without written permission.